Outline: Story dramatized. Emphasis is on no chance after death. Hell and heaven are real. Christ died, rose, and ascended that we might be free from judgment. Snare of materialism. Life is short---after death is long. Then Lazarus died, and went to heaven. The rich man also died and was buried. (Pause 3 sec.) He went to hell, and was in great pain. He cried loudly, "Have mercy on me, and send Lazarus, so that he may put the end of his finger in water and cool my tongue. I am suffering in this terrible fire." The answer came to him: "There is a great gulf between us and you, so that no one can pass from here to where you are, or from you to us. No one can pass from hell to heaven." The rich man replied, "Then I will request you to send Lazarus to my five brothers living on earth. Let him tell them about this bad place so they will not come to this place of pain. If someone who has died will tell them, they will believe." "No", was the answer. "If they do not believe the Bible, which is God's Word, they will not believe if someone comes back from the dead." Jesus also said, "I tell you the truth, if you do not turn from your sins and obey God, you also will die, and suffer punishment in hell." Jesus Christ Himself has come back from the dead. He suffered and died to take our punishment. In three days He came back to life again, and now He lives in heaven. Anyone who turns to Him, and obeys Him may be freed from this punishment. ("The wages of sin is death, and the gift of God is eternal life through Jesus Christ our Lord.") (Rom. 6:23) He can make us new people with good hearts. Do not be like the wicked man who had to suffer in hell. He did not go to hell because he was rich. He went to hell because he did not believe and obey the Word of God. 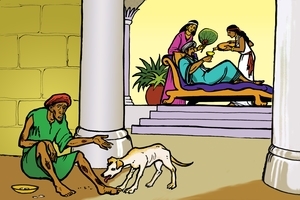 Lazarus did not go to heaven because he was poor. He went to heaven because he believed (followed) Jesus' words. Turn away from your sins in this life, because after death it is too late. This life is very short, but the life after death is very long. Who is wise among you? The one who prepares for the long future. The Bible says, "What shall it profit a man if he gain the whole world and lose his own soul?" GRN has recorded a version of this script in 719 languages and dialects. See full list.